The Law Offices of Michael Lupolover, P.C. is a law firm dedicated to vigorously defending the rights of our clients. We offer high-caliber legal representation with a practice that is designed to cater to your individual needs. Our national association helped us establish relationships in many States where we or our network of attorneys can assist you. We have consumer rights lawyers and collection harassment attorneys, focusing on providing services to help consumers just like you to stop bill collectors from calling you at work or threatening you via family members. If there are debt collectors contacting you inappropriately at work or elsewhere, the attorneys at The Law Offices of Michael Lupolover, P.C. will work with you to discuss your options to resolve the situation and possibly obtain compensation for you regarding their violation. We will never choose profit over client service and we will do everything in our ability to make our lawyers directly available to you. Most importantly, we’ll provide you with independent one-on-one assistance that shows you how to handle abusive debt collectors. We pride ourselves on achieving outstanding outcomes on behalf of consumers who have been treated unfairly. STOP THE HARASSMENT AT NO COST TO YOU. We are happy to review your situation and let you know if you have a valid case. There is no cost for a consultation and, if you are successful in an FDCPA claim, we can sue debt collector violators and possibly get you compensation for any damages you may have suffered. The best part is that the collector will have to pay your attorney fees, where applicable. In most instances, we do not charge any fees to you; we only collect from the collector. Please review our site and see what services we may be able to offer you. Feel free to call us at 1-877-235-1414. Our firm only represents people or entities in cases involving just principles or causes. Protecting your rights is our privilege. I am an experienced attorney, entrepreneur and businessman. 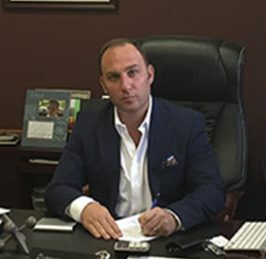 Having founded my law firm not even 10 years ago, I have already helped resolve over a half a billion dollars worth of outstanding debt and helped recover tens of millions of dollars in damages from violators. I started my legal career as a creditors rights attorney but quickly switched sides to help people and businesses resolve their financial issues. Experiencing firsthand some of the cruel and unsympathetic tactics some creditors used against my clients, I decided to expand my practice to include the prosecution against violators. I am the son of immigrant parents from the former Solviet Union and the first in my family to attend university here in the States. I graduated Hofstra University School of Law and am admitted to practice law in the State of New York, State of New Jersey and the District of Columbia, as well as the New Jersey and New York Federal Courts. I take pride in my work and providing guidance about assisting with financial issues and consumer protection laws. My passion is to help people and businesses find the best options to resolve their financial concerns. I enjoy boating, fishing and traveling. Most importantly, I am happily married with two beautiful children.